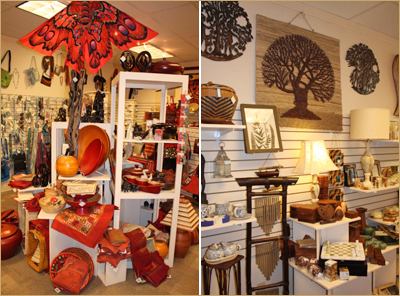 Ten Thousand Villages is a fair trade retailer that carries handmade jewelry, home decor, gifts and much more. They work with over 130 artisan groups in more than 38 countries in Africa, Asia and Latin America. Fair trade enables artisans to earn a fair wage and provides the opportunity for a better quality of life. The girls and I recently took to their local location and had a fantastic time. They have locations all over the country, in Canada and they have a wonderful selection online. Everything is made with high quality and is unbelievably beautiful. We stayed in the shoppe for hours in awe, you could tell everything was made with such talent and love. For most of the items you purchase, you will also receive information on who made it and where it was made, which makes the gift even more special. The girls and I bought these beautiful handmade Lotus Teacups and Saucers that were made from the Vietnamese artisan group Craft Link. I really enjoyed teaching the girls about the wonderful products and the story behind them. What a great cause to support! I love Ten Thousand Villages! The items are very well crafted and they don’t price gouge, as other places do at times, so these items sell fast.